A trolley will operate on a point-to-point layout using track power. This track power will be a continuous AC voltage that will power the motor, on-board electronics and lights. The constant voltage that will be available to the trolley through the track will help to insure that its lights will remain on at all times. In addition the relatively high AC track voltage should help keep the train running even as the track becomes dirty. The on-board electronic controller will accelerate the motor, sense when the train enters a section of cut track and bring the train to a stop. After pausing the motor will reverse and the operation will repeat. Programming of the microcontroller will be via a standard TV remote control using Sony codes. Program changes include setting the maximum motor speed, the length of delay at each end of the point-to-point and the acceleration / deceleration rate. Once set these changes will be remembered even after power is removed. At the end of each "lap" the controller will flash out, by means of three LEDs, the number of "laps" that have been completed. The time that it takes to flash out this information will be automatically deducted from the pause time. Other options will include sounding a bell each time the trolley stops and activating an audio track as the trolley stops. The two trolleys that were built using the AC track power system worked very well for the 2007 Christmas season. This year the circuit has been revised to make use of an inexpensive MRC AD322 DCC controller with sound capability. This microcontroller chip that normally detects and acts upon DCC commands has been removed and replaced by a PIC 16F88 that runs the same program that was used in 2007. The reason for using the new board is to make the system more compact by using AD322 board which contains the bridge rectifier, relay, power transistor, sound circuit, and audio amplifier. All that needs to be added is the PIC microcontroller and the optoisolator. This is done without a circuit board utilizing what is commonly called "dead bug" wiring. The reason for this is sure to be clear from the photos below. The schematic shows the parts of the system. In order for the on-board microcontroller to sense when it gets to the end of the track diodes are inserted in cut rails as in the drawing below. Note that the diodes are oriented differently from those that are used with DC operated point-to-point reversing systems. Both diodes have their banded (cathode) ends pointing towards the end of the track. The power for the system is 12-24 volts AC which is connected to the center section of track, between the cuts. The trolley's motor and the electronics that operate it run on direct current. The parts of the circuit below take the AC from the track and deliver it to the bridge rectifier made up of four diodes. This device converts the AC to DC which is filtered and smoothed by capacitor C2. The LM78L05 voltage regulator supplies a constant 5 volt power output that is used by the microcontroller. If you have a particularly "noisy" motor in your trolley you can use a larger value capacitor for C2. Microcontroller PIC16F88 is connected to Q1 and Q2 which operate the relay and control the motor's speed with PWM pulses. The controller uses 4 LEDs (D1 through D4) to flash out information including delay time and laps completed. Part number PNA4602M is an infrared receiver which allows the program's operation to be modified with a standard TV remote control. The motor (M) is connected to a double-pole double-throw relay. When the relay is off the motor runs in one direction. When the relay is on the polarity of the voltage is reversed and the motor runs in the other direction. Transistor Q2 is used to switch the relay on or off. Mosfet Q1 uses PWM (Pulse Width Modulation) to control the speed of the motor. The last connection to the microcontroller is from an optoisolator. This device, composed of an encased LED and light sensor, is used to determine when the engine has entered one of the cut sections of track. When the train is in the non-cut area the LED in the optoisolator is lit sees full-wave AC and the emitter is "on". When a cut section is encountered the AC becomes half-wave, the LED goes out and the microcontroller knows to decelerate the motor stopping the trolley. Capacitor C1 is used to smooth out the pulse from the optoisolator that is created when the diode cut section is encountered. The connections MUST be made as shown here or the optoisolator will not successfully note entry into the diode block at each end of the track! Place the trolley in the center area of the track and apply AC power to the track. The default speed, pause time and acceleration / deceleration rate are in effect when the unit is first operated. The engine will proceed in one direction until it encounters a cut section of track where it will smoothly decelerate, pause, flash out the number of laps completed, reverse direction and accelerate back onto the main track. During the train's cruising phase, that is when it is not accelerating, decelerating or pausing, the TV remote can be used to change settings. Aim the remote at the engine and press the ENTER button. The train should stop awaiting commands. To set pause time press the "2" key on the remote - the unit flashes the white LED twice - next enter the pause time in seconds between 0 and 255. Note that a number must be 3 digits. Enter 005 for 5 seconds. Enter 090 for 90 seconds and so on. To set the acceleration / deceleration rate press the "3" key on the remote - the unit flashes the white LED three times - enter a 3 digit number that determines the rate of acceleration. 1 gives the slowest acceleration while a higher number (anything over 20 or 30) gives almost instant speed changes. 'pause 1500 'to get out of block - change to sense or out-of-block? debug 13,10,"D-Speed= ",#temp, " "
'debug 13,10,"TEMP1 ",#temp1 ," "
'debug 10,13,"Long Horn 1 test"
GOSUB accel:PAUSE 2000 'pause to get out of block - may help? 'pause 1500   'to get out of block - change to sense or out-of-block? DEBUG 13,10,"D-Speed= ",#temp, "  "
'debug 13,10,"TEMP1 ",#temp1 ,"  "
Here is a close up of the bridge rectifier and filter cap. The standard Bachmann power units on both trolleys were replaced with ones from Bachmann Spectrum 45 Ton Center Cab Switchers. The stock power units are poor at best. The headlights are 5mm bright white LEDs. They are VERY visible. ... especially when viewed straight on! The 16F88 is the IC in the upper right. The small device above the 4 LEDs is the IR receiver. The relay is the white device bottom, center. The 6 pin IC in the bottom left is the optoisolator. The power transistor that controls the trolley's speed is just to the right of the relay. The parts that were used in the new version are shown below. The AD322 board is on the left. It will be modified and its 4 diodes (top of board), relay (blue object), power transistor (right center), power supply (lower right), amplifier (bottom center), and sound unit (lower left) will be used. The large capacitor on the right will help the trolley to navigate dirty or wet track. The microcontroller that had been on the AD322 has been removed. Connections will be made to the solder pads that it was once fastened to. Pre-wiring these three modules speeds construction. The unit at the left is the optoisolator. It is used to sense when the train enters a diode protected section of track. The unit in the center holds four signaling LEDs and their 470 ohm current limiting resistors. The socket at the right will hold the 16F88. A capacitor and a resistor have been fit inside of the socket to save space. The plug all the way to the right is used to program the PIC. The PIC's socket has been glued to the top of the relay and its wires connected. The optoisolator has been glued to the side of the relay (front center). The wires that control the sound are soldered to the pads where the other processor once resided. 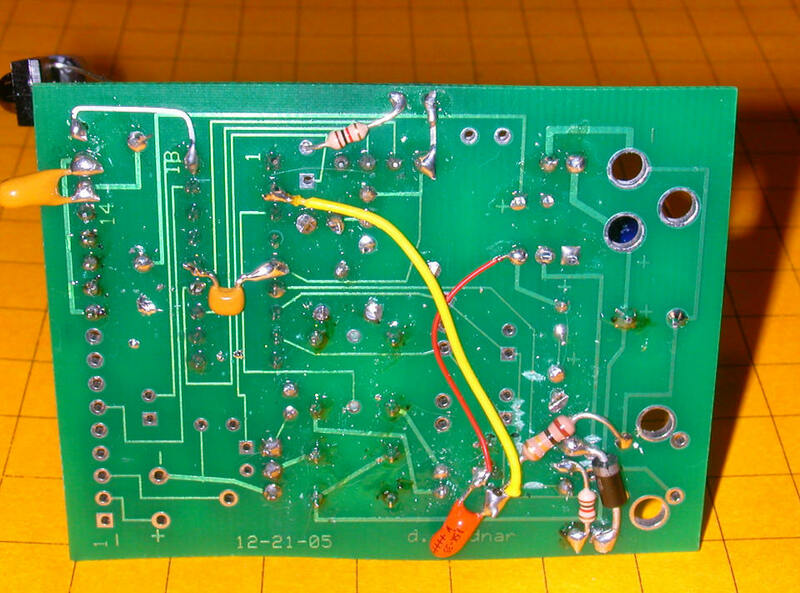 A sharply pointed soldering iron and some care are needed to prevent solder bridges and short circuits. This close-up shows the 4 pin connector that allows you to program the PIC while it is installed in the circuit. The header to the right with the green and white wires connects the optoisolator's input to the track power so that it can detect when a diode protected area in the track has been entered. Here is the bottom of the AD322 where the green and white wires are connected. The black and red wires connect to the DC output from the four diodes on the AD322 board and go to the large capacitor.